Age is not a number - it's a mindset. 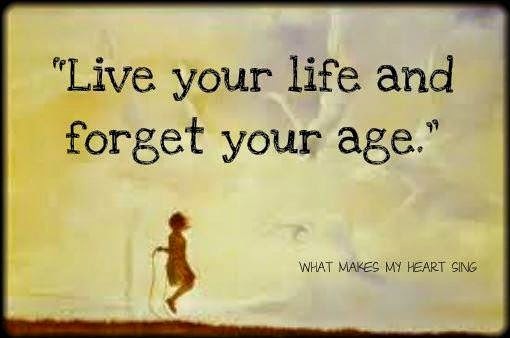 When I turned 40 I made a decision to age positively. There will be NO midlife crisis! As I slowly but surely creep towards the 45 mark I thought it timely to share some tips and tricks to help us all feel instantly younger. Gratitude: Go to bed feeling grateful. Whether it be a gratitude journal, a celebration of the day's achievements or simply counting your blessings, people who think positive grateful thoughts as they go to sleep end up sleeping longer and better than those who are feeling anxious. Sleep: Getting enough sleep is essential to our health as we age. "The only time your body can truly restore itself is when your'e asleep," says Henry Lodge MD, co-author of Younger Next Year for Women. He says it helps build a more vibrant body and brain. Smile: Research has proven that pasting a smile on your face even when you're feeling down can trick the mind into feeling happier. Using your smile muscles sends messages to the brain which then lines up all those happy chemicals. Besides, nothing makes us look younger and more vibrant than a kick arse grin. Exercise: It only takes around 20 minutes of low intensity exercise to kick start our energy levels and cut fatigue. Getting fitter helps us to feel youthful and energetic. Vanity: Seriously, the more we take care of our appearance the more we feel good about ourselves which has a flow on effect to the people around us and the energy we create. Try something new: people hit midlife crisis because they stagnate. They hit a point where they plateau doing same old, same old, which leads to a lack of growth and fulfillment. Doing new things triggers the release of the anti-aging hormone dopamine. Blonde highlights anyone? Remember: Take a step back in time and remember what it felt like to be young. Research at Harvard University has shown that revisiting our youth can boost memory, vision, happiness levels and overall health. So get on that push bike, ride down a hill, take your feet off the pedals and yell "weeeeeee"; or put your hair in a pony tail with a shiny green ribbon and skip down the street; or simply put on some INXS, Culture Club or Wham and get your wiggle on. Socialise: Whether it's social media or real life contact, be sure to take time to get outside the family unit and mingle with your friends. People with larger online social networks have denser memory centres in their brains. Like! Be positive: Remember when you were 18 and anything was possible? Guess what ... it still is! It's not what happens "to us" that is important, it's how we react to it and what action we take in response to life's little challenges. A positive mindset really helps those dopamines do their anti-aging thing. So there you have it. Ten quick tips on how to turn age from a chronological record into a mindset. What anti-aging tricks do you have? Information source: Redbook Magazine October 2014, Health Magazine www.Health.com and my own Achieve Beyond coaching techniques. Love the list - I'd add laughing (which goes with smiling) and I reckon you could be right about vanity - while I'm focusing on my 'inner beauty' as I get older, wanting to look good for a night out has to help you keep young. And I have a year on you. Love the ideas ...so true. Gratitude the big one for everyday life. My gratitude for today was being able to go out with all of my grandchildren ages 16 to 3, just me and them. To the park as they scooted on their scooters or rode bikes or helped push prams which were for the three year olds return walk home as scootering is serious business when you are little . Full throttle and wizzing down hills. Keeps me young although I admit I flaked out at home afterwards. Thanks for your words...I must take time to visit some more. Well, sometimes I do find that exercise makes me feel old! Those creaking knees! But generally I agree with all of your tips. Positivity is probably the most powerful tool, I reckon, as it helps you ride out any of the other negatives a little more gracefully.